Editing a word document,spreadsheet, presentation, speech or recipe may be easy, it is not quite the same when sewing. That’s just my opinion. Some fabrics are not as forgiving if you know what I mean. While Cottons may be an easy take down, Stretch Knit fabrics, Sateen Cotton and the likes are not as forgiving, there is great potential for damage and monies to be wasted. How do I feel about editing a sewn garment? What happens when I do have to edit? When I decide I will edit? Things just flow. Believe it or not, it’s as simple as making a decision to do something that gets the ball going and suddenly you are making it work. 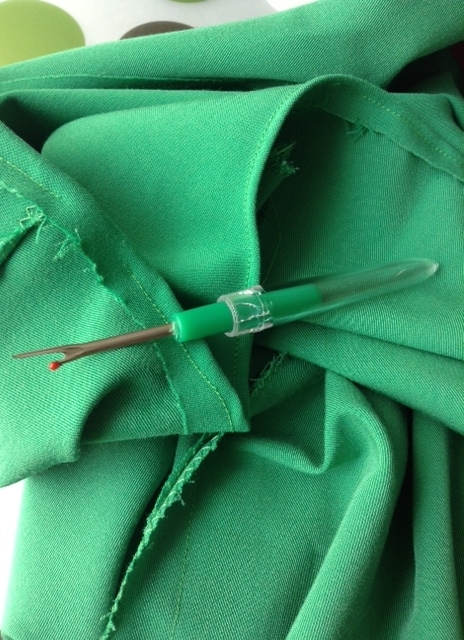 My Seam ripper is the best( Shown in photo above). This tool truly helps me endure the act of undoing a garment. It makes the task less painful. Even though my hand hurts after taking down long hems.arrrgh..
Take your time. Seriously. The less rush rush the more you will avoid major edits or damage to your fabrics. So in other words there are pros and cons to editing, yes it requires time but the finished product is even better because you took your time to make it beautiful. That’s all for now. Just keep sewing just keep sewing, what do we do we sew sew sewwwwww! Previous postTimes 2 -The Summer Onesy Repeated!!! Glad you like Cee.. totally love the last comment ” I have to fall in like” 🙂 so so true.